The bane of every poker player is variance. You can be playing well and yet your Aces can still lose to the 7 and 8 of clubs. Or you can guess correctly that your opponent is losing, only for them to get the card they need on the river. Relay races are gaffled so that people can’t just follow each other round. By the end of the race, each team will’ve done each gaffle the same number of times, to make it fair (ish), but sometimes you know that if you’d had the other gaffle your run would’ve been better (or worse). 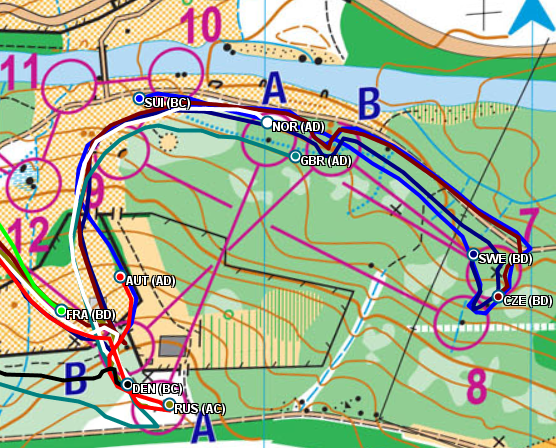 Today, Britain, Norway, Sweden and the Czech Republic all mispunched at the same pair of gaffled controls: 52 and 67, out on the far part of the course (The top A and B on the map). Each runner might’ve been okay if only they’d had the other control on their map. But poker is also about psychology. You bet £10 with your pair of nines, hoping that you’ve judged the moment when your opponent, holding jacks, doesn’t want to take the risk. Perhaps what we saw in that Colombian jungle this morning was an example of what Poirot called the Psychological Moment. 52 and 67 aren’t easy to mix up, in ordinary circumstances. In a stressful competitive situation like a gold-medal sprint relay, where you’re pushing yourself to the limit, the planner has (accidentally?) been very crafty by putting the two controls on similar features along on the same ditch, on the part of the course where you’re beginning to think about the route home. 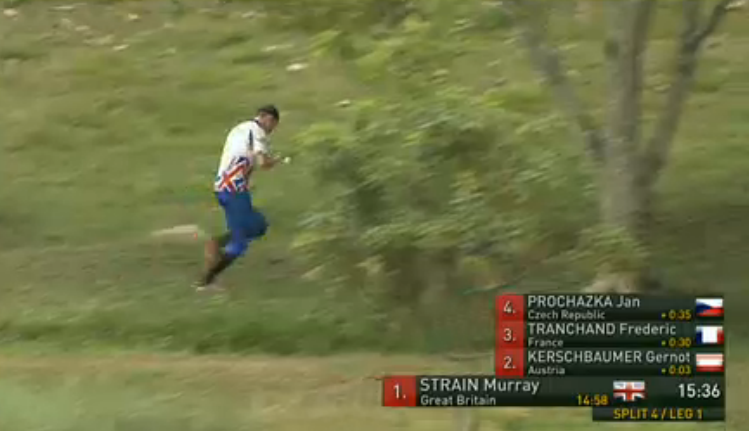 At the point shown on the map, Scott Fraser has just run past his own control and is about to punch the wrong one. Around him are three other teams that won’t finish the race. 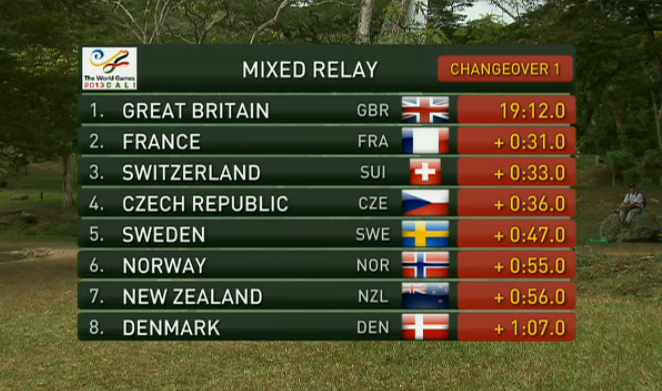 Denmark, who appear to be eighth, go on to win the Silver medal half an hour later. So four expert orienteers were defeated by psychology and variance. But they’ll fight back another day.